It’s about time that Oregon wins a national championship. That’s a bold statement, I know, but I assure you there are reasons for such a claim. The Ducks — specifically, Marcus Mariota – finally got a Heisman Trophy last year, but winning the final game still eludes the green and yellow. That is going to change soon. 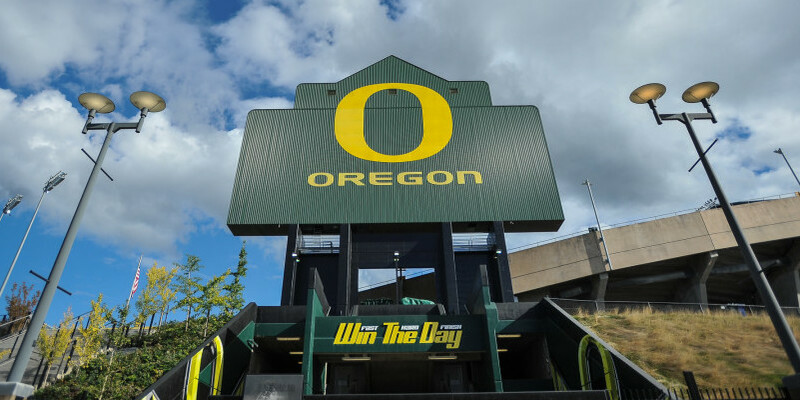 Here is some context of Oregon’s recent greatness: Miami went 46-4 from 2000 to 2003, USC went 68-8 from 2002 to 2008 (not including the overwritten 2005 season), and Alabama has gone 84-11 since 2008 – while Oregon has gone 70-11 since 2009. The only difference is that Miami, USC, and Alabama won at least one national title during their span of dominance, and Oregon has not. Marcus Mariota and his Heisman Trophy. Essentially, Mandel doesn’t believe that the Ducks can win a title in the new playoff format because they won’t be able to beat two good teams in a row. His reasoning? “The reason is simple: [Traditional] programs still land most of the best recruits.” While that may be accurate, recruiting isn’t a direct indication of success. If it was, Florida State would have beaten the Ducks in the Rose Bowl last year, and we all remember how that turned out. Mandel is correct about one thing – winning a national title, or any championship for that matter, is extremely difficult. And let’s be honest here, no one expected Ohio State to even make the College Football Playoff last season, until they beat Wisconsin 59-0 in the Big Ten title game. In other words, Ohio State got on a roll and crashed the playoff party. To use the TCU example, why couldn’t the Frogs, who beat No. 9 Ole Miss, 42-3, in the Chick-fil-A Peach Bowl last year, beat two “superior, talented” teams in a row? If the only answer is because they don’t recruit as well as the traditional schools, the argument doesn’t hold much weight. Winning 13, 14, or even 15 games in a college football season is going to be difficult for any team, traditional powerhouse or not. Oregon won 13 games last season, the most in school history. No one said it would be easy. However, if any team has the capability to catch fire and crash the party, it’s the Oregon Ducks. Oregon does a great job in recruiting and often signs 4-star recruits from across the country; also, the Ducks hold the best record for a non-traditional powerhouse team over the last five years. Even with the loss of Heisman Trophy winner Marcus Mariota, the Ducks will likely be a preseason top-10 team and favorites to win the Pac-12 North. Not only has the talent on the Oregon roster improved tremendously over the years, but the expectations have soared to new heights, as well. If Oregon does end up winning the Pac-12 title, the Ducks might be playoff bound once again. When Oregon lost to the Auburn Tigers, led by Cam Newton, in the 2010 national title game, few people outside of Eugene thought the Ducks would be back any time soon. The offense was a gimmick, the Ducks were too small and too soft, and there was no way a team from “Track Town USA” with little football tradition could routinely compete with the traditional powers of college football. The reality, however, was that Oregon actually got better in the years following the loss. Consider this: In the year following Oregon’s first national title appearance, the Ducks went 12-2 and won the Rose Bowl. After losing the first game of the season against LSU, the Ducks climbed back up to No. 4 in the rankings before losing to USC, November 19. If the Ducks had won that game, they would have probably played in the national title game again in 2011. The next year was much of the same. If Oregon beats Stanford on November 17, the Ducks likely go back to the national title game in 2012. Instead, Oregon finished the season with a 12-1 record, a Fiesta Bowl win, and the No. 2 ranking in the country. 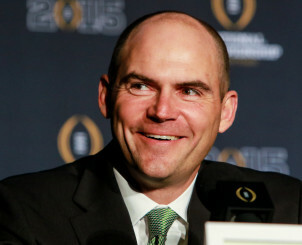 Coach Helfrich WILL win a national title at Oregon. Both losses, to USC and Stanford, came by a combined six points — with Oregon missing field goals to tie in both games. Even with the two losses, the Ducks went to two national title games in five years — a feat only bested by Oklahoma, Florida State, and Alabama since 1999 when the BCS began. However – once again – all three of those teams won at least one national title, and Oregon is still 0-2. It will, however, take dedication, execution and a little bit of luck for Oregon to finally capture their first national championship. The Ducks haven’t fallen off yet, and if the last five years is any indication, the Ducks will continue to contend for championships in the future. Oregon has grown itself into a college football juggernaut – that’s just a fact. Yes, the Ducks haven’t won a national title yet, but every year they put themselves into a position to compete for one and that alone, is extremely difficult to do. Oregon pushed its way into the upper echelon of college football, and now, they must push a little harder in order to win their first national title. You can only knock on the door so many times before you have to just kick it down.